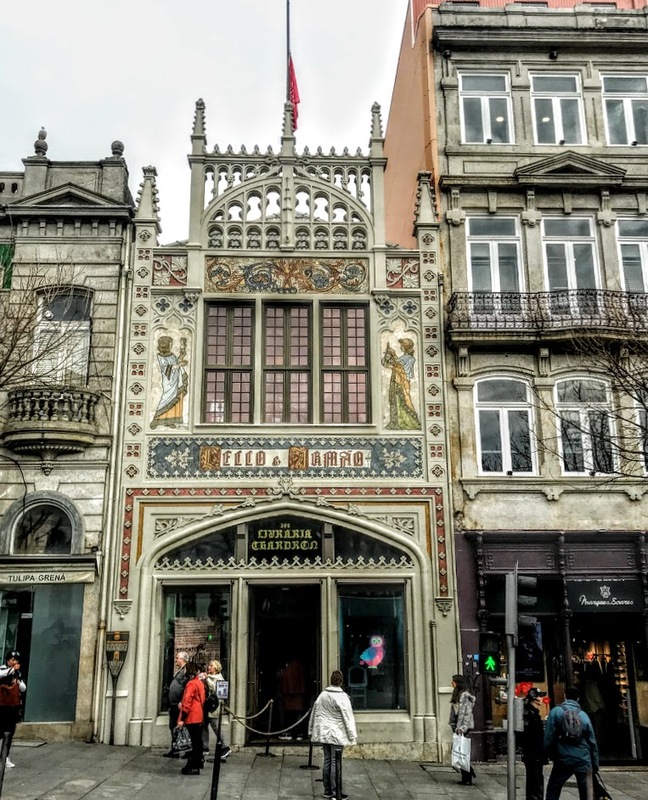 This has become a two-country, or two-city break, staying Porto in northern Portugal, but travelling north across the border into Spain on Wednesday [6 February 2019] and continuing along the pilgrim route to visit Santiago de Compostela. 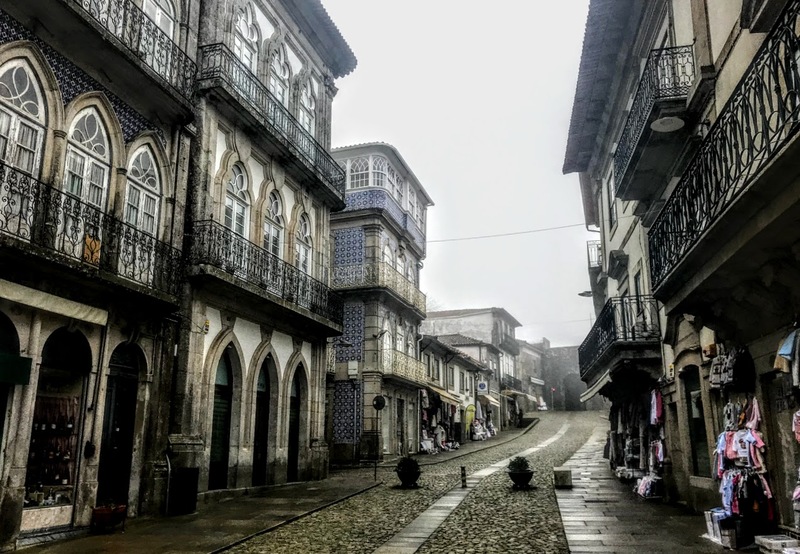 Before crossing the border between Portugal and Spain, I stopped for breakfast at the border town of Valença do Minho, where the two countries are separated only by the Minho river. This is as far north in Portugal as you can travel by train and it is set in the lush Minho region, surrounded by craggy mountains and wide rivers, with the Minho River forming the natural border with Spain. 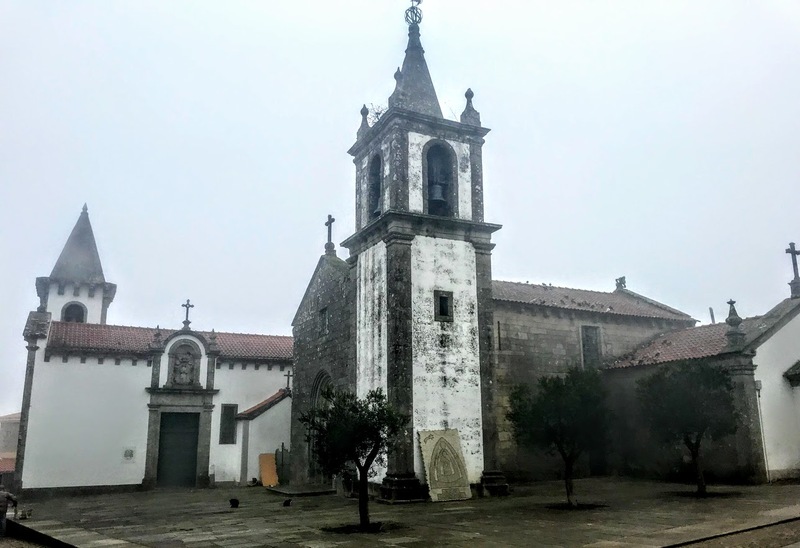 It was a foggy morning, and in this peaceful, rustic setting it was hard to imagine how this was once a significant military posting, repelling successive onslaughts from Spanish and French armies. 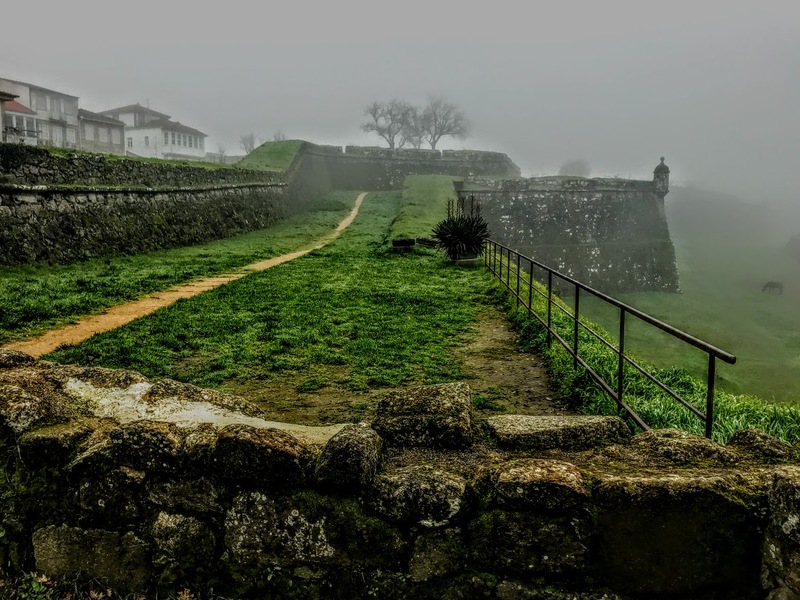 Valença sits on top of a hill, about 25 km inland from the Atlantic, and is surrounded by defensive walls that have survived as a visible testimony to its key strategic position ever since Roman times. Valença was of extreme significance during the Middle Ages, with its commanding hilltop view across the border. But this was also along the pilgrim route, and was a stopping point on the on the pilgrims route along the camino to the shrine of Saint James the Apostle at Santiago de Compostela. Ti[berius] Claudius Caesar Aug[ustus] Germanicus Pontifex Max[imus]. 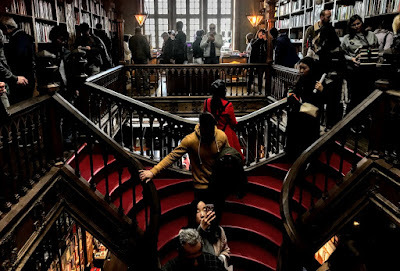 Imp[erator] V Co[n]s[ul] III, Trib[unicia] Potest[ate] III. P[ater] P[atriae] Braca[ra] XLII. In other words, it marks 42 Roman miles (62 km) on the road from Braga to Tui and the Emperor Claudius ordered its construction when the Via IV of Antonine was rebuilt. For a short time in the early morning mist, we strolled through the town’s narrow streets and compact squares as we explored the labyrinth of fortifications, submerged passages and jutting watchtowers, and tried to catch a view from the Baluarte Do Carmo (Carmo Bulwark) across the Rio Minho to the Spanish fortified town of Tui on the opposite bank. 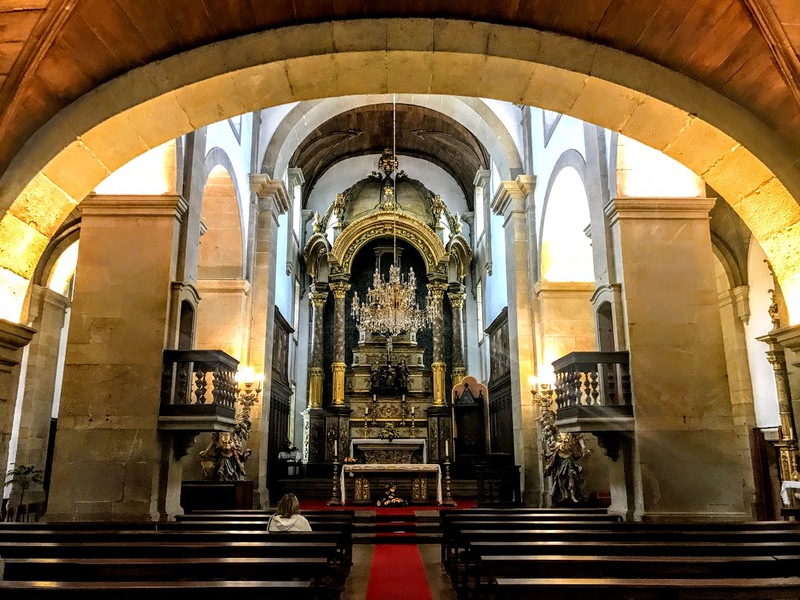 As a stop on the camino, it came as no surprise to find many churches, chapels and religious sites religious sites inside Valença, along with elegant townhouses built in the past by prosperous merchant families. 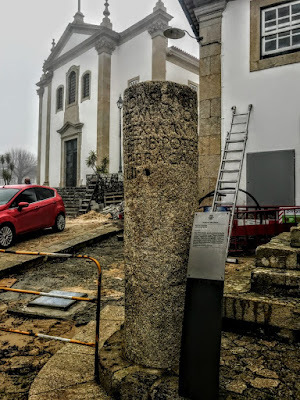 The local patron saint is São Teotónio, the first Portuguese saint. He was born in Ganfei, near Valença, and was the confessor of King Afonso Henriques. The churches and religious monuments include the Colegiada de Santo Estêvão Church and the Santa Maria dos Anjos Church, both dating from the 13th century, the 16th century Misericórdia Church, the 17th century Church of the Bom Jesus, and the chapels dedicated to São Sebastião and Nossa Senhora da Saúde. The Romanesque Igreja de Santo Estêvão, dedicated to Saint Stephen, was rebuilt in the 18th century. The church holds a unique painting of the Virgin Mary feeding the Christ Child, and several panels representing scenes in the life of Saint Stephen. The Church of Saint Mary of the Angels, a Romanesque church built in the 12th century, has eye-catching decorations and ceiling. The town is dominated by the Fortaleza, which is one of the most impressive fortifications in northern Portugal. This is an impressive fortress with two concentric walls, two towers and many layers of battlements, bastions and hidden tunnels. The fortress and its two towers and double walls were rebuilt in the 17th and 18th centuries by Louis XIV’s military engineer, Sébastien Le Prestre de Vauban (1633-1707), who also refortified the Palace of the Kings of Majorca in Perpignan and rebuilt the Fort de Salses, or the Forteresse de Salses, a massive Catalan fortress near Perpignan, and both of which I visited last year [May 2018]. Along the north wall, several old cannons are well maintained in their original positions, pointing north to the river and Spain as reminders of their original purpose. Portugal and Spain agreed in 1879 to build a road and rail bridge crossing the border. The bridge was inspired by Alexandre Gustave Eiffel (1832-1932). The bridge is still in use although a new bridge was built south-west of the older one in recent years. 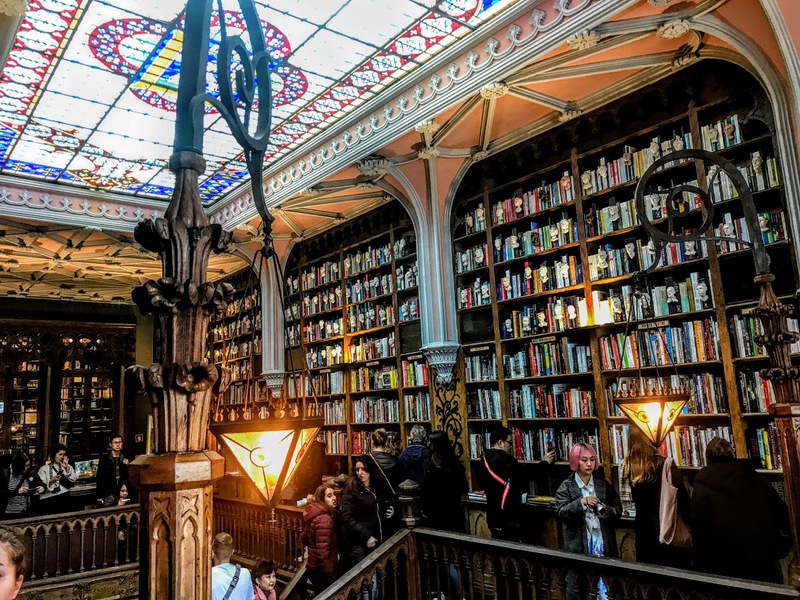 Today, the centre of the town has cobbled and stone-paved narrow streets with traditional small shops specialising in hand-made products, including gold, linen, weaving, ceramics and pottery. Valença has a population of 14,127 (2011) and has been a city officially since 2009. Outside the walls, the new areas include social facilities, schools, a stadium and sports centre, a health care centre, a municipal market and a swimming pool. Today, the Spanish invasion takes a different form, with bargain-hunting Spanish tourists flocking to Valença city to buy cheap clothes, textiles and linen products. 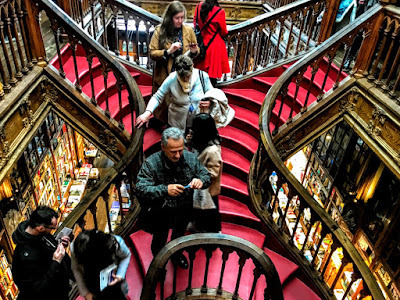 But it was too early in the year for tourists in any large numbers … and I was heading in the other direction, north along the pilgrims’ route towards Santiago de Compostela. On a pilgrim’s way, borders – hard or soft – fade away and become meaningless.